Background: The implantable cardioverter-defibrillator (ICD) is effective in the prevention of sudden cardiac death in high-risk patients. Little is known about ICD use in the Arabian Gulf. We designed a study to describe the characteristics and outcomes of patients receiving ICDs in the Arab Gulf region. Methods: Gulf ICD is a prospective, multi-center, multinational, and observational study. All adult patients 18 years or older, receiving a de novo ICD implant and willing to sign a consent form will be eligible. Data on baseline characteristics, ICD indication, procedure and programing, in-hospital, and 1-year outcomes will be collected. Target enrollment is 1500 patients, which will provide adequate precision across a wide range of expected event rates. Results: Fifteen centers in six countries are enrolling patients (Saudi Arabia, United Arab Emirates, Kuwait, Oman, Bahrain, and Qatar). Two-thirds of the centers have dedicated electrophysiology laboratories, and in almost all centers ICDs are implanted exclusively by electrophysiologists. Nearly three-quarters of the centers reported annual ICD implant volumes of ≤150 devices, and pulse generator replacements constitute <30% of implants in the majority of centers. Enrollment started in December 2013, and accrual rate increased as more centers entered the study reaching an average of 98 patients per month. Conclusions: Gulf ICD is the first prospective, observational, multi-center, and multinational study of the characteristics and, the outcomes of patients receiving ICDs in the Arab Gulf region. The study will provide valuable insights into the utilization of and outcomes related to ICD therapy in the Gulf region. The evolution of clinical trials of ICD therapy for secondary and primary prevention of SCD and the adoption of current national practice guidelines has lead to a considerable increase in the use of ICDs worldwide. In the Arab Gulf region, utilization of ICD therapy in high-risk patients had increased in the past decade with the arrival of trained electrophysiologists in the Gulf states. While observational studies in the United States and Europe have evaluated ICD use in those regions, there are scarce data on the adoption of ICD therapy in the Gulf. Few single center or relatively small studies have reported early results, and to date there are no prospective, multinational data on ICD use from the Gulf. ,,, The Gulf ICD registry (Gulf ICD) is a prospective, multi-center, multinational, and observational study of patients receiving ICDs in the Arab Gulf states. The present report describes the methodology and implementation of Gulf ICD. Gulf ICD is a prospective, multi-center, multinational, and observational study. The primary objective of the study is to describe the characteristics and the outcomes of patients receiving ICDs in the Arab Gulf region. Once completed, the data collected from Gulf ICD will be available for further secondary analyses including a description of ICD implant indications and programing patterns in the Gulf. As this is an observational and descriptive study, no specific endpoint is considered primary. However, main outcomes to be measured include all-cause mortality and ICD discharges including appropriate discharges for ventricular tachyarrhythmias and inappropriate discharges for other causes. Other endpoints to be measured include adverse events in the immediate postimplant period. All adult patients 18 years or older, receiving a new ICD implant and willing to sign a consent form will be eligible and invited to participate. Subjects with existing ICDs undergoing pulse generator replacements or system revisions will not be included. All subjects will be treated per routine clinical practice. There will be no study-specific interventions/treatments. Unlike randomized controlled trials where specific hypotheses are tested, and primary comparative analyses are planned, observational studies and patient registries typically address descriptive objectives. Such objectives do not lend themselves to classic sample size/power calculations. Nonetheless, sample size considerations are important in the planning of registries. Typically, an adequate sample size is required to ensure acceptable precision around key outcomes and provide sufficient generalizability. With that in mind, we wanted to ensure adequate precision around two key outcomes: All-cause mortality and/or rate of appropriate ICD discharges at 1-year. To estimate an event rate of 10% at 1-year with a margin of error of 2% and 95% confidence intervals, a sample size of 829 patients is required. Since there is little guidance in the literature on such event rates among ICD recipients in the Gulf, and to compensate for losses to follow-up, we adjusted our sample size upward to 1000 patients. After additional funding was secured, and more centers were recruited into the study, the sample size was increased to 1500. Such a sample size was considered logistically feasible given our experience with ICD implant rates in the Gulf. The revised sample size would also allow for adequate precision (not more than 2% error margin with 95% confidence level) across a wide range of expected event rates [Figure 1]. Standard descriptive statistics will be used to summarize the data. Continuous variables will be summarized using mean and standard deviation or median and 25 th and 75 th percentile when significant deviation from a normal distribution is observed. Categorical variables will be summarized using counts and percentages. Basic univariate comparisons will be performed using Student's t-test or the Wilcoxon rank sum test as appropriate for continuous variables, and the Chi-square test for categorical variables. Associations between baseline variables and outcomes during the follow-up will be assessed using logistic regression or when exact event dates are available Cox proportional hazard models. Gulf ICD is an investigator-initiated study conducted under the auspices of the Gulf Heart Association, Saudi Heart Rhythm Society, and Gulf Heart Rhythm Society. The study is funded by Medtronic and Boston Scientific. The study's principal investigators and steering committee members are solely responsible for the development of the protocol and CRF, implementation of the study, analysis of data, and publication of results. All CRFs will be filled prospectively. Quality control checking mechanisms are implemented in the online CRF system to prevent the entry of inconsistent variables (e.g., in the presence of history of cardiac arrest, the system will not allow classifying the implant as primary prevention). Investigators will retain the paper CRFs per local ethics regulations. Paper CRFs will be stored in a secure area with access only available to study investigators. The online CRF portal will be password protected. The study will be conducted in accordance with the protocol and applicable local regulatory requirements and laws. It is the responsibility of the investigator to get the prospective approval of the study protocol, consent form, and any amendments from the local Institutional Review Boards/Ethic Committee. Study conduct will also conform to the 2013 version of the Declaration of Helsinki on Ethical Principles for Medical Research Involving Human Subjects adopted by the General Assembly of the World Medical Association. Each study subject will be informed about the study objectives and procedures and consented prior to enrollment in the study. The study is registered on clinicatrials.gov (identifier NCT02491853). At the time of this writing, 15 centers in 6 countries are enrolling patients in Gulf ICD (Saudi Arabia, United Arab Emirates, Kuwait, Oman, Bahrain, and Qatar). [Table 1] describes the participating centers. Two-thirds of the centers have dedicated electrophysiology laboratories and the remaining centers implant ICDs in nondedicated cardiac catheterization laboratories or operating rooms. In 14 of the 15 centers, ICDs are implanted exclusively by electrophysiologists and in one center nonelectrophysiologist cardiologist also perform implants. On average, there are two implanters per center, and ICD implantation has been performed for an average of ~10 years. Nearly three-quarters of the enrolling centers reported annual ICD implant volumes of 150 devices of less, and pulse generator replacements constituted <30% of implants in the majority of centers. All centers either rarely or never perform defibrillation threshold testing or use remote home monitoring of ICDs. Most centers use several ICD manufacturers. 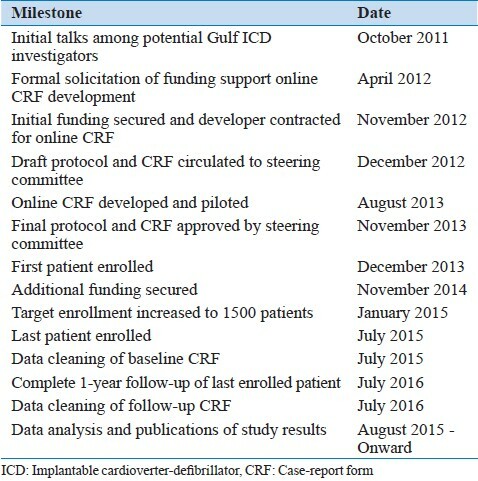 [Table 2] outlines accomplished and anticipated the milestones of the Gulf ICD study. Enrollment started December 2013, and accrual rate increased as more centers entered the study. At present, the study is enrolling an average of 98 patients per month. In January 2015 and after reviewing enrollment rate and securing additional funding, the steering committee decided to increase the target sample size to 1500 patients. Gulf ICD is the first prospective, multinational, and systematic study of the characteristics and the outcomes of patients receiving ICDs in the Arab region. This investigator-initiated and industry-funded study is being conducted under the auspices of the Saudi Heart Rhythm Society and Gulf Heart Rhythm Society, professional organizations of electrophysiologists in the Arabian Gulf. Enrolling sites are the highest implanting centers in the participating countries and are estimated to account for >90% of all ICD implants in the Gulf. 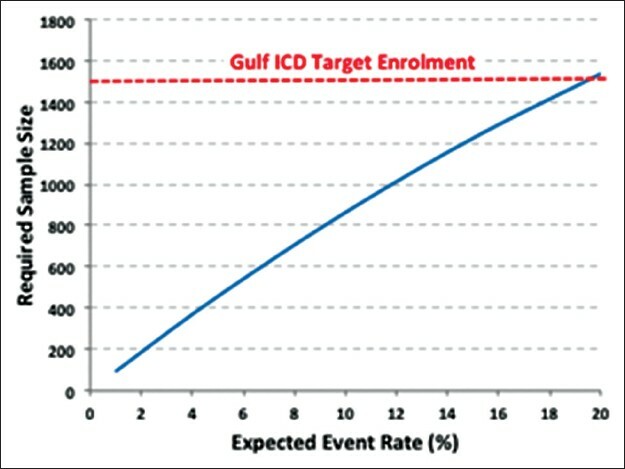 Data from Gulf ICD is expected to provide unique insights into the utilization of and outcomes related to ICD therapy in the Gulf region. Well-designed disease-based registries can provide useful information to complement evidence from clinical trials. Clinical effectiveness of therapies with proven efficacy in controlled clinical trials can be validated in the uncontrolled setting of common clinical practice. This value of registry-based data has been realized with the evidence for ICD-benefit. While claims data is another appealing source of information often used for observational studies, disease-based registries offer certain advantages over claims based studies. These include the ability to define variables and standardize definitions prospectively, ensure data completeness, and allow for adjudication of outcomes. Furthermore, in the Gulf region, claims data are either not collected or not readily available for outcomes research to date. Therefore, insights from well-conducted and representative disease-based registries remain the one of the few resources for policy makers in the region to benchmark disease management and identify opportunities for improvement. In addition to the generic utility of disease-based registries in supplementing the evidence-based for implantable defibrillators, an ICD registry in the Arab Gulf region provides additional specific value. Recent cardiovascular registries in acute coronary syndrome, atrial fibrillation, and acute HF have highlighted unique patient characteristics in the region, including younger age and a higher prevalence of diabetes. In addition to a unique patient risk profile, other region-specific features may be relevant including care-seeking behavior, a propensity to certain adverse events, and variation in processes of care. These patient- and system-level variations may be important modifiers of anticipated benefit or harm from proven therapies. Furthermore, the ability to prospectively collect detailed information on programing parameters for tachycardia therapies will provide a unique opportunity to validate the value of recent programing strategies, which have been shown to improve outcomes in ICD recipients. Collecting outcomes after discharge will also allow for measuring rates of appropriate and inappropriate ICD discharges in this population. Gulf ICD is strengthened by its prospective design, multi-center, and multinational enrollment, and the representative centers participating in the study which are estimated to account for >95% of all ICD implants in the countries of Gulf ICD. The findings may not be generalizable to the pediatric population receiving ICD in the Gulf, or to patients with existing ICDs receiving pulse generator replacements or system revisions. We anticipate that follow-up to be a challenge in centers where a significant number of patients may expatriates who may typically leave the Gulf after an ICD implant. In addition to the value of the scientific output from Gulf ICD, it offers infrastructure for future research in the region in the form of a network of collaborative investigators who are willing to work together and generate new knowledge. The platform for future arrhythmia research in the region is stronger after Gulf ICD. The existing study would also have a capacity to continue with extended follow-up, or future versions focusing on areas that we did not cover in this study (e.g., pediatric), or technology that was not included (e.g., subcutaneous ICD), or systematically collected (e.g., cardiac MRI preimplant). Gulf ICD is the first prospective, observational, multi-center, and multinational study of the characteristics, and the outcomes of patients receiving ICDs in the Arab Gulf region. A total of 1500 patients will be enrolled. The study will provide valuable insights into the utilization of and outcomes related to ICD therapy in the Gulf region. Gulf ICD is conducted under the auspices of the Gulf Heart Association, Gulf Heart Rhythm Society, and Saudi Heart Rhythm Society. The study is funded by Medtronic, Inc. and Boston Scientific, Inc. We thank Dr. Elsayed Abdulrahman Mahmoud, PhD for his logistical support. Conducted under the auspices of the Gulf Heart Association, Gulf Heart Rhythm Society, and Saudi Heart Rhythm Society. Funding provided by Medtronic Inc. and Boston Scientific, Inc.
Epstein AE, DiMarco JP, Ellenbogen, KA, Estes NA 3 rd , Freedman RA, Gettes LS, et al. ACC/AHA/HRS 2008 Guidelines for device-based therapy of cardiac rhythm abnormalities: A Report of the American College of Cardiology/American Heart Association Task Force on Practice Guidelines. J Am Coll Cardiol 2008;51:e1-62. Epstein AE, DiMarco JP, Ellenbogen, KA, Estes NA 3 rd , Freedman RA, Gettes LS, et al. 2012 ACC/AHA/HRS Focused Update Incorporated into the ACC/AHA/HRS 2008 Guidelines for device-based therapy of cardiac rhythm abnormalities: A Report of the American College of Cardiology/American Heart Association Task Force on Practice Guidelines and the Heart Rhythm Society. J Am Coll Cardiol 2013;61:e6-75. Daoulah A, Alsheikh-Ali AA, Ocheltree AH, Ocheltree S, Al-Kaabi S, Malik M, et al. Outcome after implantable cardioverter-defibrillator in patients with Brugada syndrome : t0 he Gulf Brugada syndrome registry. J Electrocardiol 2012;45:327-32. Hersi AS. Implantable Cardioverter Defibrillator Therapy: A Single Center Experience in Saudi Arabia [Abstract]. The Open Cardiovascular Medicine Journal 2010;4:92. Alsheikh-Ali AA, Alkaabi S, Elhag O, Mahmud R, Rasheed A, Al-Kasser M, et al. The implantable cardioverter-defibrillator in the united arab emirates: Preliminary findings of a national survey [Abstract]. Circulation 2012;125:515. Al-Rawahi N, Al-Kalbani A. Indications for cardiac devices implantation in oman [Abstract]. Circulation 2012;125:518. Buxton AE, Calkins H, Callans DJ, DiMarco JP, Fisher JD, Greene HL, et al. ACC/AHA/HRS 2006 key data elements and definitions for electrophysiological studies and procedures : a0 report of the American College of Cardiology/American Heart Association Task Force on Clinical Data Standards (ACC/AHA/HRS Writing Committee to Develop Data Standards on Electrophysiology). J Am Coll Cardiol 2006;48:2360-96. World Medical Association. World Medical Association Declaration of Helsinki : e0 thical principles for medical research involving human subjects. JAMA 2013;310:2191-4. Concato J, Shah N, Horwitz RI. Randomized, controlled trials, observational studies, and the hierarchy of research designs. N Engl J Med 2000;342:1887-92. Parkash R, Sapp JL, Basta M, Doucette S, Thompson K, Gardner M, et al. Use of primary prevention implantable cardioverter-defibrillators in a population-based cohort is associated with a significant survival benefit. Circulation Arrhythm Electrophysiol 2012;5:706-13.